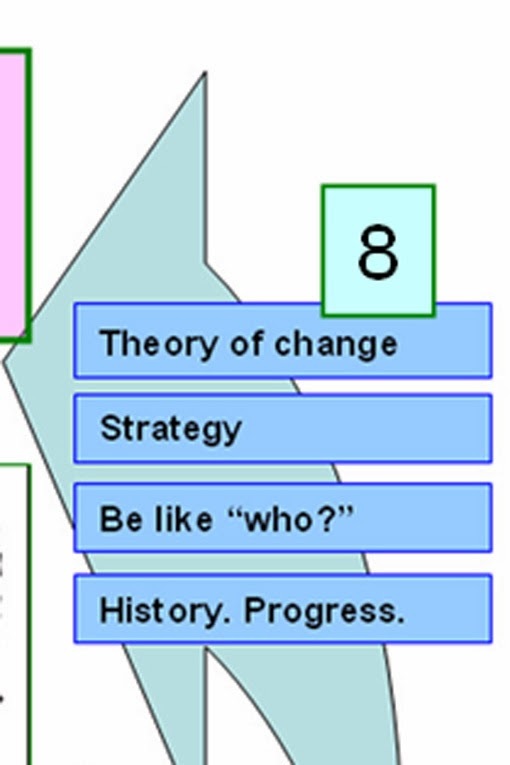 I posted this graphic on my blog in April 2013. It expresses a lot of ideas. So I thought I’d try to break it down into components, which I've done below. If you visit this blog you can see these components in a YouTube video created by one of my 2014 interns. I feel this graphic is important to understand because if we want mentor-rich youth programs helping kids in more places move through school and into jobs we must influence what resource providers do at the same time as we're influencing what youth programs do. This requires a huge, on-going vision, and a wide range of intermediary supports. Here is same graphic, but with numbers on different parts. In the paragraphs below I’ll show the meaning. 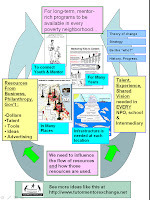 First, the goal of this graphic, and the Tutor/Mentor Institute, LLC is to help high quality, long-term, site-based tutor/mentor programs grow in high poverty neighborhoods. This section of the Tutor/Mentor web library includes dozens of research articles that show the impact of poverty, indicating the potential benefits of mentor-rich programs. 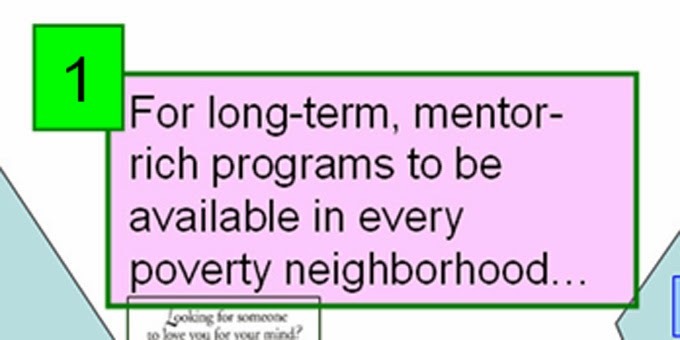 Second, if we want mentor-rich programs in more high poverty neighborhoods, then we must find ways to increase the flow of needed resources to all programs, and keep this consistent for many years. To do that we need to influence what the donor and resource provider do, not just what programs do. I’ve been following the National Mentoring Summit via a live feed for the past two days and posting comments on Twitter. There are about 800 people at the Summit, and between one-, and two-hundred subscribed to the live feed. In one of the featured discussions yesterday, David Gregory, Host of NBC's Meet the Press, was a speaker. @davidgregory has over 1.6 million Twitter Followers. Justin Bieber @justinbieber has 49 million followers. @MENTORnational has only 3663 followers. As of yesterday @tutormentorteam has almost 1600 followers. These are “attention gaps” we need to close and we cannot do that without more consistent, and strategic, support from business, public leaders, media and other potential resource providers. A tutor/mentor program supports a connection between an adult volunteer with a youth living in an area where indicators show extra adult support and learning activities are needed. 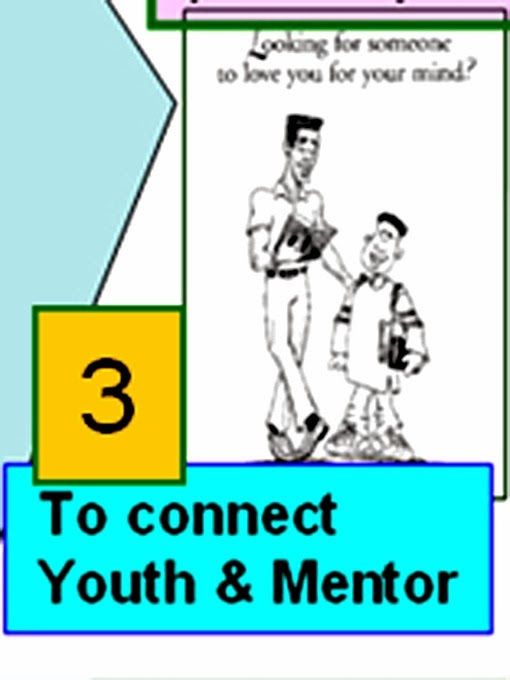 NOTE: many mentoring strategies are nor primarily focused on youth living in high poverty. However, there is much research showing that for youth living in high poverty the non-school hours offer risk if not filled with positive learning activities and that there are too few resources in most neighborhoods. The Tutor/Mentor Institute's primary focus is helping mentor rich programs reach youth living in high poverty areas of big cities like Chicago. 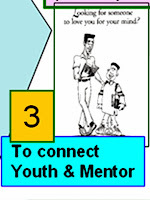 There are a wide variety of formal mentoring programs, and many youth are involved in informal mentoring. 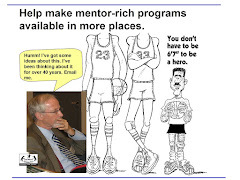 This New Report: The Mentoring Effect, shows that too few youth are engaged in formal mentoring. 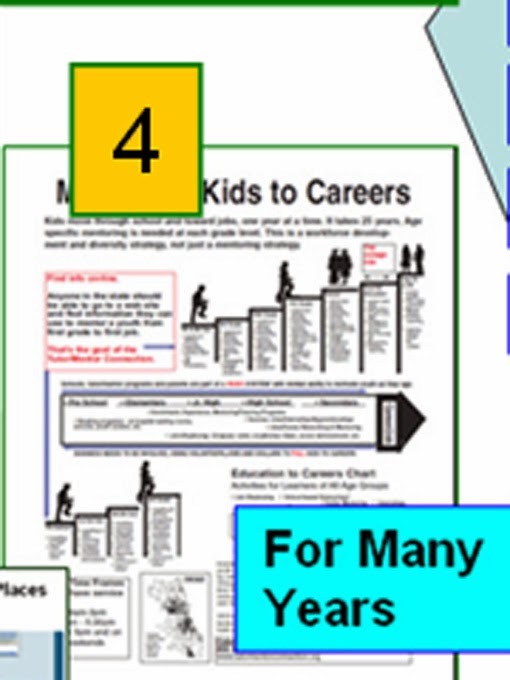 This is one graphic from my web site illustrating a need to support youth for many years. 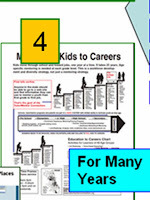 On Pinterest.com you can find more graphics like this, which point to a long-term result, which is when kids have made the journey from first grade through high school, post high school learning, and into jobs with family level wages or better. 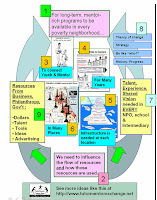 Our aim is to help youth programs build strategies that support this long-term goal. 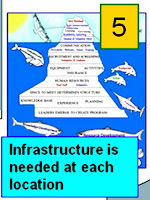 This graphic is intended to illustrate the infrastructure needed in every tutor/mentor program. Most people, including youth and volunteers, don’t see the work it takes to recruit and retain youth and volunteers, and find the operating dollars and other resources needed to build an ongoing program. 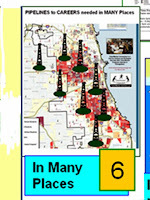 See this graphic at this link. 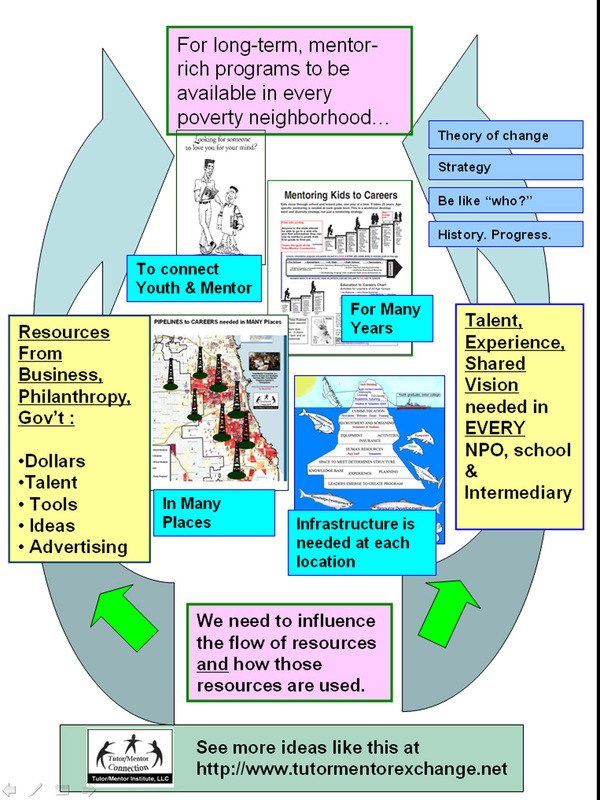 I’ve piloted uses of maps since 1994 to illustrate the need for tutor/mentor programs in every high poverty neighborhood of Chicago. 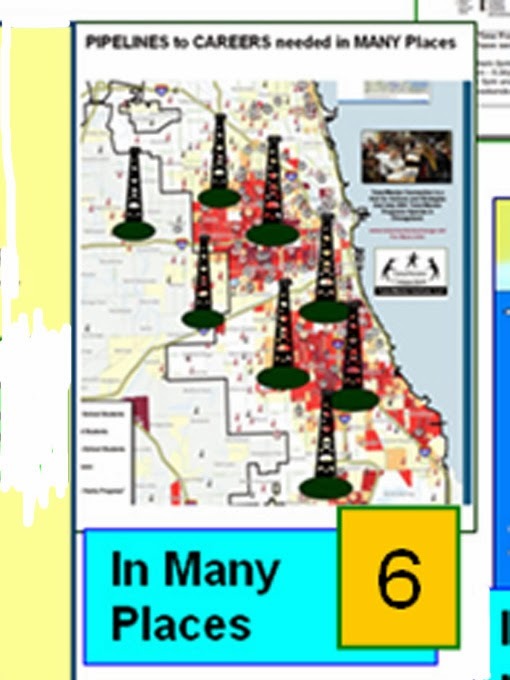 Without the maps donors and media focus on a few high profile programs, or a few high profile neighborhoods. You don't get a distribution of resources to all of the neighborhoods, or all of the programs, which need consistent support. Most efforts to support non profits, including tutor/mentor programs, share ideas that help programs improve themselves, and their operations. This concept map shows a section of the Tutor/Mentor Web library that represents a college of resources that tutor/mentor leaders could draw from to be better at what they do. However, most smaller programs are so overwhelmed and under financed that they can't draw from this information for on-going learning as much as they need to. This section of the library should be read by business leaders, donors and policy makers. 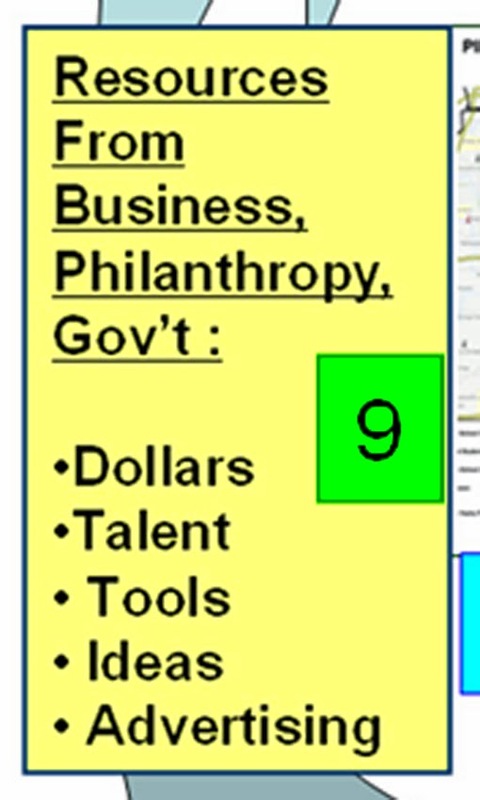 It shows challenges facing non profits. 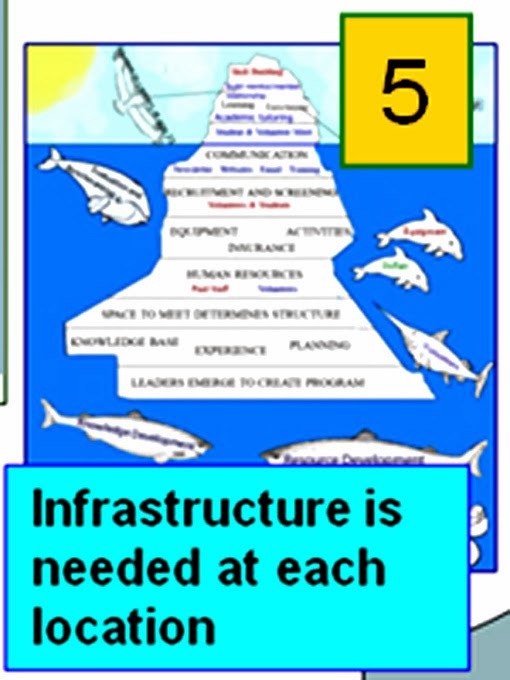 As the Iceberg graphic demonstrated, every program has common needs for a wide range of talent. Few have the money to hire all the talent they need or purchase the best technology and other tools needed to run a high quality business. This is where we need to grow. Business leaders have tremendous expertise in building chains of stores operating in multiple locations. I wrote about Polk Bros recently, showing how advertising and sales promotion were used to draw customers to stores. 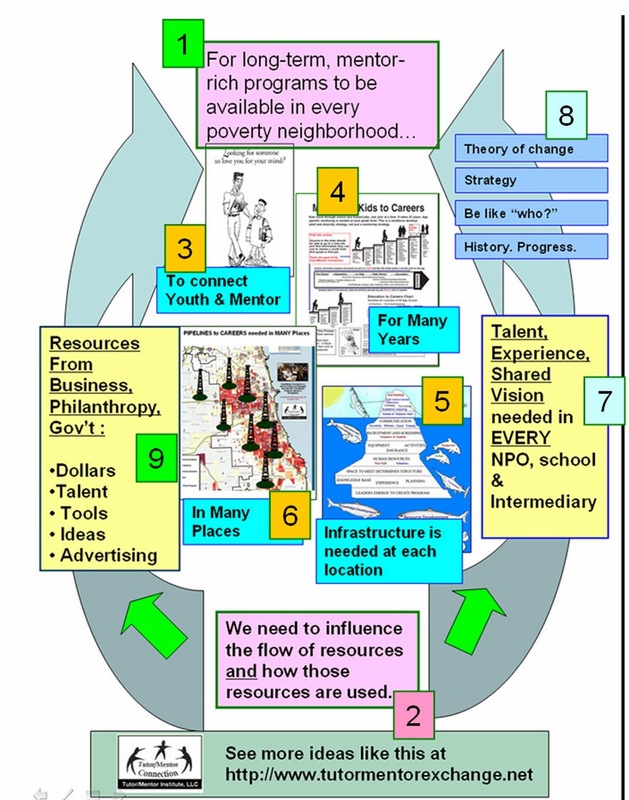 On Pinterest I show many graphics that illustrate the role of business and professionals could take to draw needed resources to volunteer-based tutoring and/or mentoring programs all over the city. 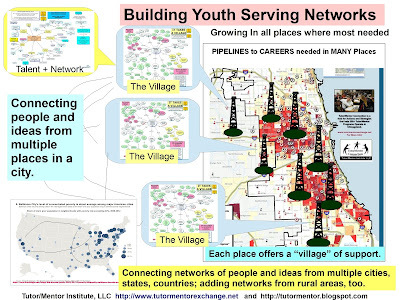 I created this “Virtual Corporate office PDF” to illustrate the way volunteer talent in many companies and industries could be mobilized and focused on supporting the growth of tutor/mentor programs throughout big cities like Chicago. If programs are consistently supported, and are constantly learning from each other, and engaging all of their supporters in efforts to constantly improve the organization’s impact, they should be able to show on their web sites many indicators of their value and impact. This pdf illustrates some of the things a “shopper” should want to see when looking at a tutor/mentor program’s web site. Teams of volunteers from business, universities, high schools, etc. could help programs collect and share this information on web sites, and could provide some of the advertising support needed every day to encourage more people to look at these web sites and provide support to help one, or many, programs grow. As a result of this support there should be many programs with a long-term history and the ability to posts murals like this, showing youth and volunteers who have been part of programs in the past, and who are still connected to those programs today, while helping programs provide services to the next generation of youth. Now, when you look at this graphic, do you understand what it is showing? Can you share this with people in your own network? Take a look at this blog to see how interns have been creating visualizations and new interpretations of graphics like this. Start a project at your school, or in your church or in your tutor/mentor program, where youth and volunteers create their own interpretations, focusing on your own community and/or school neighborhood if you're not in Chicago.